What Is the Difference Between a Wasp & a Mud Dauber? Though mud daubers are a type of wasp, many characteristics set them apart from the "typical" wasp. Both are of the Hymenoptera order. The differences between the creatures start there and range from the way that they look to what and how they feed. With more than 30,000 identified species, wasps make up a large contingent of the flying insect population. Though humans are most familiar with the types that sting, many kinds are harmless to people. Fully grown, a wasp can reach 1.5 inches in length and is identifiable by body type as well as by varied and distinctive coloration. Mud daubers fall into the solitary hunting wasp category, while creatures like yellow jackets and hornets are social varieties. Of the two primary subgroups, social wasps are the minority. Only about 1,000 types exist, though these colonies may be extremely large and reach up to 5,000 members. 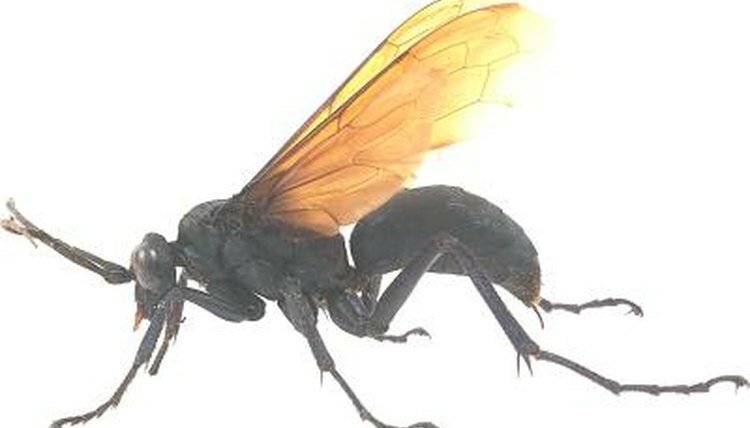 Social stinging wasps are the ones humans come into contact with most frequently; these fall into the Vespidae family. Mud daubers fall into the solitary wasp category, preferring to avoid human contact. They prefer not to sting and will not defend their nests the ways social wasps do. Solitary wasps fall into either the insect-hunting Sphecidae or spider-hunting Pompilidae families. Mud daubers are spider hunters -- some use black widow spiders as a food source. They paralyze their prey before sealing it into the nest cells for their young, as well as before eating it immediately. Being paralyzed helps to preserve the prey. Social wasps have more variety in their diets, eating insects, plant nectar, caterpillars and even fruit. Some particularly aggressive species of social wasp drink the blood of honey bees. Different types of mud daubers are identified by their nests, built under eaves and on walls or other flat surfaces. Nests of the organ-pipe species look similar to the pipes they are named after; black and yellow daubers enclose a group of cylinders within a smooth, fist-size nest; and the blue variety simply uses nests abandoned by the black and yellows. Each nest is made with mud carried and formed by the females. The nests of other wasp types may be made from wood pulp, chewed and constructed by females and their young. These nests might be inside hollow plants, in trees, behind walls and even under the ground. As they are home to colonies of wasps, these nests tend to be larger and more complex than those of the mud dauber, though they are usually much more concealed. One distinguishing characteristic of mud daubers is a thin, threadlike waist. Although most are dark and uniform in color, some varieties have bright yellow markings. They reach only about an inch in length -- so they're smaller than other types of wasp. Social wasps have a variety of colors; although they too have pronounced waistlines, they're not elongated like mud daubers'. Their abdomens are pointed at the back end and angle downward. Brighter colors tend to signify more aggressive species like yellow jackets and hornets.